Vedi was very important while performing rituals. On the top of "Vedi" different type of geomit(geometry: as you notice this word is derived from a Sanskrit word)) were made. To measure those geometry properly, "geometrical mathematics" was developed. 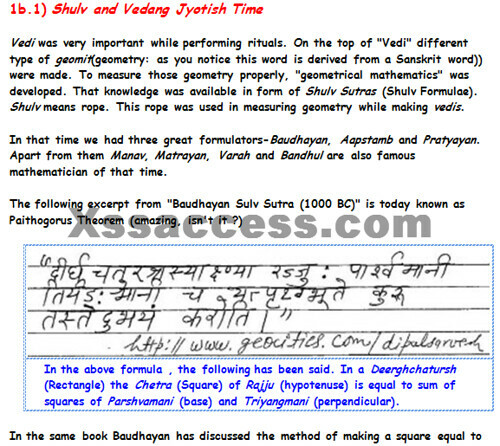 That knowledge was available in form of Shulv Sutras (Shulv Formulae). Shulv means rope. This rope was used in measuring geometry while making vedis. In that time we had three great formulators-Baudhayan, Aapstamb and Pratyayan. Apart from them Manav, Matrayan, Varah and Bandhul are also famous mathematician of that time. The following excerpt from "Baudhayan Sulv Sutra (1000 BC)" is today known as Paithogorus Theorem (amazing, isn't it ? )In the above formula , the following has been said. In a Deerghchatursh (Rectangle) the Chetra (Square) of Rajju (hypotenuse) is equal to sum of squares of Parshvamani (base) and Triyangmani (perpendicular). Meaning: Multiply the date by 11, then add to it the "Bhansh" of "Parv" and then divide it by "Nakshatra" number. In this way the "Nakshtra" of date should be told. This is unfortunate that except for the few pages of the books Vaychali Ganit, Surya Siddhanta and Ganita Anoyog of this time, rest of the writings of this time are lost. From the remainder pages of this time and the literature of Aryabhatt, Brahamgupt et-cetera of Middle Time, we can conclude that in this time too Mathematics underwent sufficient development. Sathanang Sutra, Bhagvati Sutra and Anoyogdwar Sutra are famous books of this time. Apart from these the book titled Tatvarthaadigyam Sutra Bhashya of Jain philosopher Omaswati (135 BC) and the book titled Tiloyapannati of Aacharya (Guru) Yativrisham (176 BC) are famous writings of this time. This period is called golden age of Indian Mathematics. In this time great mathematicians like Aryabhatt, Brahmgupt, Mahaveeracharya, Bhaskaracharya who gave a broad and clear shape to almost all the branches of mathematics which we are using today. The principles and methods which are in form of Sutra(formulae) in Vedas were brought forward with their full potential, in front of the common masses. To respect this time India gave the name "Aryabhatt" to its first space satellite. He was a resident of Patna in India. He has described, in a very crisp and concise manner, the important fundamental principles of Mathematics only in 332 Shlokas. His book is titled Aryabhattiya. In the first two sections of Aryabhattiya, Mathematics is described. In the last two sections of Aryabhattiya, Jyotish (Astrology) is described. In the first section of the book, he has described the method of denoting big decimal numbers by the alphabets. He did matchless work on Indeterminate equations. He expanded the work of Aryabhatt in his books titled Mahabhaskariya, Aryabhattiya Bhashya and Laghu Bhaskariya . His famous work is his book titled Brahm-sfut. This book has 25 chapters. In two chapters of the book, he has elaborately described the mathematical principles and methods. He threw light on around 20 processes and behavior of Mathematics. He described the rules of the solving equations of Beezganit (Algebra). He also told the solution of indeterminate equations with two exponent. Later Ailer in 1764 AD and Langrez in 1768 described the same. Brahmgupt told the method of calculating the volume of Prism and Cone. He also described how to sum a GP Series. He was the first to tell that when we divide any positive or negative number by zero it becomes infinite. He wrote the book titled "Ganit Saar Sangraha". This book is on Numerical Mathematics. He has described the currently used method of calculating Least Common Multiple (LCM) of given numbers. The same method was used in Europe later in 1500 AD. He derived formulae to calculate the area of ellipse and quadrilateral inside a circle. He wrote books titled "Nav Shatika", "Tri Shatika", "Pati Ganit". These books are on Numerical Mathematics. His books on Beez Ganit (Algebra) are lost now, but his method of solving quadratic equations is still used. This is method is also called "Shridharacharya Niyam". The great thing is that currently we use the same formula as told by him. His book titled "Pati Ganit" has been translated into Arabic by the name "Hisabul Tarapt". He wrote a book titled Maha Siddhanta. This book discusses Numerical Mathematics (Ank Ganit) and Algebra. It describes the method of solving algebraic indeterminate equations of first order. He was the first to calculate the surface area of a sphere. He used the value of pi as 22/7. He wrote the books titled Siddhanta Shekhar and Ganit Tilak. He worked mainly on permutations and combinations. Only first section of his book Ganit Tilak is available. His famous book is titled Gome-mat Saar. It has two sections. The first section is Karma Kaand and the second section is titled Jeev Kaand. He worked on Set Theory. He described universal sets, all types of mapping, Well Ordering Theorems et-cetera.One to One Mapping was used by Gailileo and George Kanter(1845-1918) after many centuries. He has written excellent books namely Siddhanta Shiromani,Leelavati Beezganitam,Gola Addhaya,Griha Ganitam and Karan Kautoohal. He gave final touch to Numerical Mathematics, Beez Ganit (Algebra), and Trikonmiti (Trignometry). Not much original work was done after Bhaskaracharya Second. Comments on ancient texts are the main contribution of this period. Please find below a list of famous mathematicians and their writings. He wrote books on Geometrical Mathematics, Numerical Mathematics and Trignometry. He wrote books titled Deergha Vritta Lakshan(which means characteristics of ellipse), Goleeya Rekha Ganit(which means sphere line mathematics),Samikaran Meemansa(which means analysis of equations) and Chalan Kalan. Ramanujam is a modern mathematics scholar. He followed the vedic style of writing mathematical concepts in terms of formulae and then proving it. His intellectuality is proved by the fact it took all mettle of current mathematicians to prove a few out of his total 50 theorems.